You have searched / sorted by Product Industry. All the products listed below are sorted by category and are related to the Industry you selected, indicated above. Header bar colors reflect the given product category. This information is provided to help you determine which tape products are best suited for a given industry and / or application. 7150RE Red, polypropylene carton sealing tape with a rubber-based adhesive 2 22 oz. Rubber Economy carton sealing tape for closing of shipping cartons. CT-IMP White, polypropylene, custom imprinted carton sealing tape with a rubber-based adhesive 2.6 32 oz. Rubber Custom imprinted, economy carton sealing tape for closing of shipping cartons. JH819 Clear, polypropylene, carton sealing tape with a high tack rubber-based adhesive 1.9 35 oz. 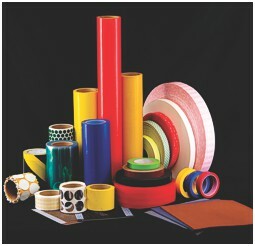 Rubber Economy carton sealing tape for closing of shipping cartons. JR2450 Transparent, "writable" polypropylene cast film, no static or tunneling, application tape with a non-yellowing acrylic-based adhesive 4 3/6 oz. Acrylic Exceptional clarity surface protection and for easy registration of multiple colors or layers of sign vinyl. EL7 Black, electrical PVC tape with a rubber-based adhesive; available in red, white, blue, yellow, green and gray 7 18 oz. Rubber Wire and cable insulation, bundling, splice insulation and color identification. JH515YE Yellow, general-purpose, PVC Tape with a rubber-based adhesive 6 19 oz. Rubber Color coding, printer circuit board masking, safety equipment identification, aisle and hazard marking, decorative packaging and stripping. JH700 Clear and Tan, UPVC carton sealing tape with a high tack rubber-based adhesive 2.1 32 oz. Rubber Heavy duty carton sealing tape for closing of shipping cartons. JH707 Colored, UPVC carton sealing tape with a high tack rubber-based adhesive; available in yellow, black, white, red, orange, green and blue 2.4 14.6 oz. Rubber Heavy duty carton sealing tape for closing of shipping cartons. JH75 Black/Yellow, PVC hazard tape with a rubber-based adhesive; available in red/white, black/white and green/white 7 22 oz. Rubber Identify safety equipment/hazard marking, coding, marking fire exits, routes and equipment. JR300 Colored, matte finished, soft PVC, sign vinyl tape with a rubber-based adhesive; available in red, white, blue, green, orange, yellow and black 3 N/A Rubber Used for sign vinyl decals, color coding, aisle marking and safety coding, stripping on vehicles, artwork and sporting equipment decals, plating, anodizing, harness and pipe wrapping, scrapbooking. P32 Colored, matte finished, PVC tape with a rubber-based adhesive; available in red, white, blue, green, orange, yellow, brown, purple and black 5.2 18 oz. Rubber Used for sign vinyl decals, color coding, aisle marking and safety coding, stripping on vehicles, artwork and sporting equipment decals, plating, anodizing, harness and pipe wrapping. 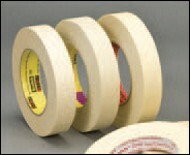 Tesa 4124 White and transparent, PVC, premium packaging tape with a rubber-based adhesive 2.6 29.2 oz. Rubber Closure of medium and heavy-weight cartons; available in hand dispensers and automatic sealing equipment. 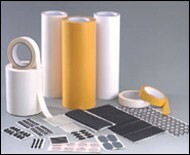 Tesa 7475 PVC film with a modified acrylic-based adhesive to record the interaction of a silicone and an acrylic adhesive N/A N/A Silicone/ Acrylic Test tapes for the characterization of silicone coatings.